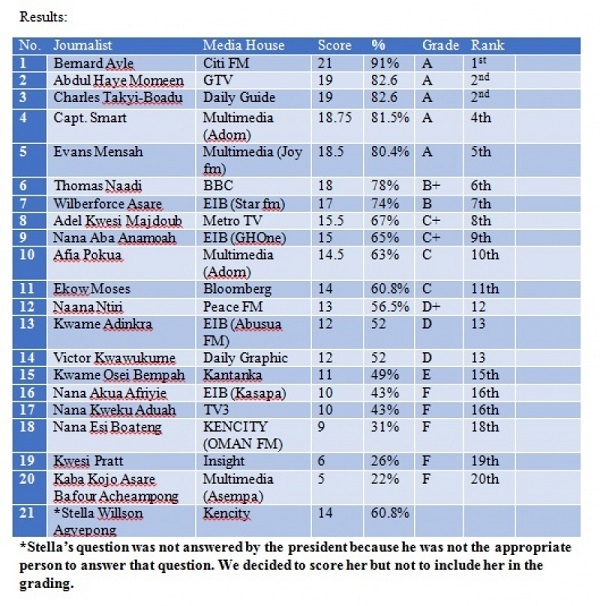 This score/grading is part of the results of a TV content analysis study done on the questions journalists posed to President Akufo-Addo during his maiden encounter with the media, six months into his administration. The researchers believe that the type of questions asked by journalists is as important as, if not a trigger to, the kind of responses from the president. The research is a collaborative work between media and political analyst Dr Etse Sikanku (host, World Affairs, Class91.3FM) and a journalist and academic Kwaku Botwe of the National Film and Television Institute. It is the second in the series of research work in this area which aims at systematically assessing the quality of questions posed by journalists in Ghana during presidential press conferences. In 2016, the researchers conducted a similar examination of questions asked during President Mahama’s press conference. The goal of this research is to contribute to media monitoring and media development in Ghana’s fledgling democracy. The research is guided by the mediated deliberative theory which posits that democracy is a deliberative and communicative process which includes stakeholders such as the media or journalists who sometimes exercise the function of mediation on behalf of the public. Content analysis was the methodological approach employed in this research. This methodology is a major approach used to analyse media content by communication researchers. This research is a systematic and empirical investigation guided by the following criteria: relevance of questions, specificity of questions, and the quality of questions asked. These categories were used to construct a coding guide which was used to analyse the data. The sample included all the research questions asked in the press conference and the unit of analysis was the individual questions posed by journalists. The journalists were scored based on the following criteria – relevance of question, specificity of question, and quality/standard of question.